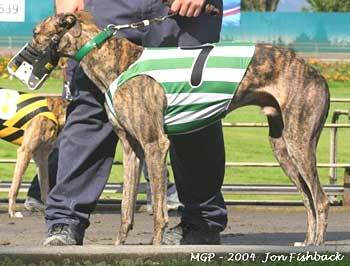 Bugle Boy, which is his registered name, is a very handsome 3-year-old red brindle male, born May 2, 2002. 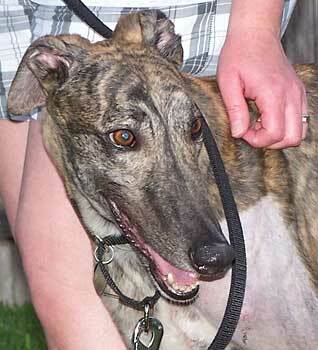 His sire is Gable Dodge, making his grand-sire Wigwam Wag, and his dam is R's True Love. Bugle Boy is a sibling to Terry and Magic. His racing career started December 7, 2003 at Gulf Greyhound Park in La Marque, TX, moving to Valley Race Park in Harlingen on January 24, 2004 where he was a Grade AA racer. 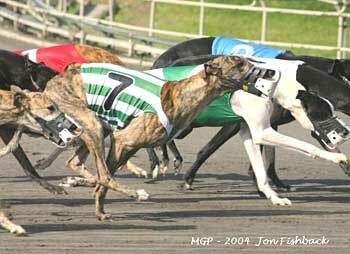 When the track closed for the 2004 season, Bugle Boy started racing May 1 at Multnomah track in Oregon, returning finally to Valley Race Park on November 19, 2004. Bugle Boy's racing career promptly came to a halt on January 22, 2005, at Valley Race Park when he fell in the first turn. This resulted in a very severe fracture to his left wrist, ending that period of his life. 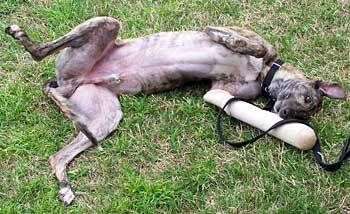 Bugle Boy was transported to Dr. Marty Tanner, the greyhound injury specialist at Elgin, Texas, who performed his surgery. That was almost 6 months ago, and Bugle Boy has now been completely released from Dr. Tanners care. Bugle Boy was in a foster home in Austin, and is now ready to find his forever couch and home! He is very loving and affectionate. Bugle Boy is not small animal or cat tolerant. Bugle Boy has lived with us since July and has fit in beautifully with our busy household of two little boys and two other dogs. Although he is not small-animal tolerant, he gets along wonderfully with the dogs and the kids, often sprawling out in the middle of the living room to have his tummy rubbed. Generally, Bugle Boy's injured wrist does not limit his activity. He runs and bounds around the yard with our other dogs, clearing three steps to make it up on our back porch. He can also easily jump into our SUV to go for a ride, and he enjoys walking on a leash. He would do better in a one-story house, though, as our flight of stairs is a bit much for him. He loves toys, which leads to his only bad habit - stealing our kids' toys. But he doesn't do much damage and gladly gives them back when you ask. Other than that, he has perfect manners - he is completely potty trained, does not beg at the table or surf for food on the counter, doesn't chew, and sleeps all night in his kennel. He is a sweet dog with the most innocent, loving eyes you've ever seen. After spending his life at the kennel until his injury in January, he is more than ready to find his own family to love.